These are a favorite around my house and neighborhood. Peel and coarsely grate the potatoes, sweet potatoes and beets. The key to this recipe is the coarse grind – I use a mandolin with the coarsest setting and I try to get most of the slices pretty long (1 ½ – 2 inches). Soak all of the grated potatoes and beets in water for 10 or more minutes to draw out the starch. 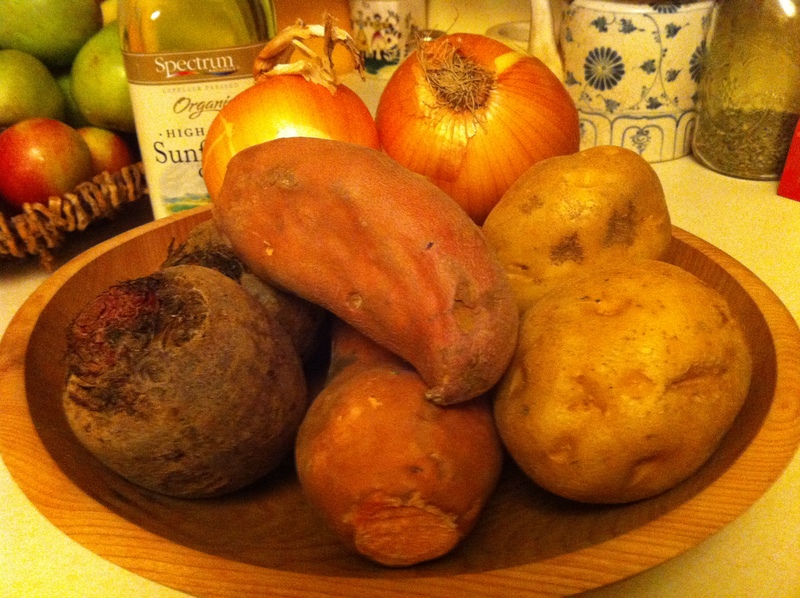 Then lift the potatoes out of the water and put them in a colander to drain. Some people wrap the potatoes in cheesecloth and squeeze out the water or at least dry the potatoes with a clean dish cloth. I don’t always do this but water will accumulate in the bottom of the bowl once everything is mixed together. I just keep banking the latke batter up on the side of the bowl and use the drier parts. Combine the potatoes with the sliced onion, flour, eggs and salt. Mix it all up. I usually start with the smaller amount of eggs and flour but if the potatoes don’t look well coated or if the latkes fall apart in the pan, add more eggs and/or flour. Depending upon the size of the potatoes that you use, you might need even more than this recipe calls for. Pour about ¾ inch of oil into the pan (or two or more pans if you want to get these cooked up in time for dinner) and heat on medium-high. When hot, add about 1/3 cup dollop of the latke batter into the pan and press down to make a latke about the size of your palm – 2-3 to a pan. Cook till crispy on the edges, about 5 minutes, flip and repeat. While the first latkes are cooking, turn oven on to 200 and line a cookie sheet with paper towels. As the latkes are done, put them on the paper towels. Then transfer them in a big platter in the oven to keep warm. Serve with applesauce or sour cream. Personally, I like them with both! 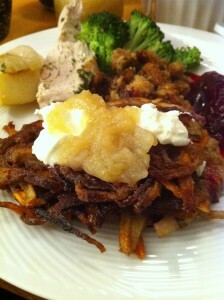 This entry was posted in Main courses, Recipes, Side dishes and tagged Gluten-free, kid-friendly. Bookmark the permalink. Both comments and trackbacks are currently closed.